Super Bowl Sunday is one of the great days of the year for company’s looking to make a big TV advertising splash. Hyundai will be looking to hit big with 4 news ads, which feature a couple of celebrity appearances, during Super Bowl 50. Innocean Worldwide are the agency behind the ads this year, and they will be looking to touch on a number of different emotions, whilst also making sure to highlight Hyundai’s “We make things better” motto. Hyundai’s 2016 Super Bowl ads will, of course, also showcase new vehicle capabilities and technologies. While speaking with AdWeek, Innocean USA CEO Tim Blatt emphasized the need to create ads that really stand out on Super Bowl Sunday. With such a large viewing audience tuning in, the ads need to feature a little something for everyone. Making that happen is easier said than done, but Hyundai and Innocean went out of their way to do so. They tapped a couple of big name celebrities in Ryan Reynolds and Kevin Hart, and they also hired three big-name directors to helm the ads. The “First Date” ad spot features Kevin Hart as an overly protective father who uses the technology in his Hyundai Genesis to keep track of his daughter. Hart offers the keys to his car to a young man arriving to pick up the daughter for a date. The young man is unaware that the Hyundai Blue Link Car Finder has been activated, and is surprised when dad keeps showing up at different spots all through the night. The ad was directed by Peter Berg, who you may know from Lone Survivor and Friday Night Lights. Berg was also the man behind the camera in the “Ryanville” spot, which we will talk about shortly. The second ad, known as “Better,” is all about Hyundai and their branding campaign. The 60-second spot, which was directed by Fredrik Bond of MJZ Productions, follows the life of a baby as he grows into a man and goes out of his way to make the world a better place. Dean Evans, CMO, Hyundai Motor America, told Adweek that one of the things that Hyundai wanted to accomplish as a brand was to make things better, and he feels they can convey that by making consumers feel something inside when they see these ad spots. There will also be a pair of 30-second spots aired during Super Bowl 50, and they will focus on fun and technology. The first of the two spots is called “The Chase” and it features a couple running through the woods with a pack of bears in hot pursuit. Directed by Aaron Stoller of Biscuit Filmworks, the ad shows just how handy the voice-activated remote starter on the Elantra can be, although we pretty quickly find out that the couple may not have been in as much danger as they initially thought. Ryan Reynolds in the main attraction in “Ryanville,” the second of the two 30-second ads. Reynolds is hot right now, with his new movie Deadpool right around the corner, but the ladies in this ad find him hot for other reasons. The two women in the Elantra see Mr. Reynolds in a number of different guises, which of course causes them to take their eyes off the road. Luckily for them, the safety features in the Elantra keep them safe. 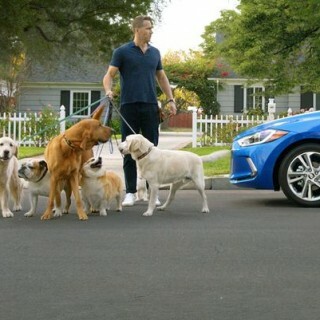 These ads will be mark the 8th time in 9 years that Hyundai have aired at least one Super Bowl ad. Hyundai and Innocean plan to be active during the game, as they will have 15-20 people packed into a room, where they will monitor social media activity. They will also have a number of on-site activations in San Francisco in the days leading up to the big game.